Alexander Balacki, First Deputy at the Coroner’s office, takes a Philadelphia Inquirer reporter and photographer on a tour of the morgue, in Norristown, PA, Friday, Oct. 13, 2017. Alexander Balacki, First Deputy at the Coroner’s office, Montgomery County, Norristown, PA is shown in the storage room that holds microscopic slides of organ tissue. Six corpses — some shrouded in white, others enveloped in orange body bags — were stacked two to a gurney inside a freezer. Four more cadavers chilled in a walk-in cooler. In an adjacent autopsy suite, a pair of forensic pathologists was conducting an examination on a middle-aged man laid out on a perforated steel table. On a recent October morning, the heavy stench of decomposing flesh hung in the air inside the labs at the Montgomery County Coroner's office in Norristown, 20 miles northwest of Philadelphia. The scent didn't faze a pair of county employees. On just the other side of lab doors emblazoned "biohazard," they were preparing a party in an office kitchenette, unboxing a cake and washing strawberries. In large part due to the opioid crisis, bodies are piling up at coroners' and medical examiners' offices. Drug overdoses killed more than 64,000 people in the United States last year, nearly triple the number recorded in 1999, according to the Centers for Disease Control and Prevention. Of those who died in 2016, about 53,000 were attributed to opioids. The surge in deaths has busted budgets across the United States as pathologists struggle to keep up. In Pennsylvania and New Jersey, health officials in communities large and small have had to go begging for additional funds to cover the explosive growth of autopsies, toxicology tests, and overtime hours. "It's a national problem," said Brian Peterson, president of the National Association of Medical Examiners, which accredits the forensic pathologists who perform death investigations. "We're kind of up against a wall. There's not enough of us and there's too much work to do." In suburban Montgomery County, for example, the number of fatal drug-related overdoses rocketed from 177 in 2015 to 249 in 2016, said Alexander Balacki, the county's first deputy coroner. "We went over budget about 33 percent last year," Balacki said. "We have not increased our staff over many years. The total number of bodies is up 40 percent, but the staffing has stayed the same. The drug-related deaths keep mounting and there are still regular, everyday coroner investigations going on." Not every fatal overdose victim receives a full postmortem, which can cost $1,300 to $1,500 to determine the cause and manner of death, Balacki said. But each receives an examination. Typically, each is given a toxicology test that can run $190 and an additional $280 if deadly fentanyl or its analogs are suspected. Body bags and toe tags add an additional $25 a body. In Philadelphia, the number of autopsies at the medical examiner's office has risen about 20 percent since 2013, from 2,489 to 3,018 last year, said department spokesman James Garrow. That required a doubling in the budget for supplies and materials — gowns, safety equipment, and body bags — and the hiring of a new assistant medical examiner. The city doesn't break out individual costs. "We're too big an operation," Garrow said. As large municipalities struggle to absorb the expense, rural communities are feeling the unexpected brunt of opioid deaths the hardest. "It's a mess," said Chuck Kiessling, coroner for Lycoming County, in north-central Pennsylvania. He believes the opioid crisis has yet to peak. "It's going to get worse over the next five years. I've already forewarned my commissioners we're in for a really rocky road." In Lehigh County, coroner Scott Grim said he was forced to ask officials for an additional $150,000 in mid-August to cover expenses for the remainder of the year. "That doesn't even cover payroll," Grim said. "That's strictly autopsies and toxicology." Overtime is also ratcheting up the strain on the bottom line. "Our costs are astronomical," said Grim. Workers, he said, usually end their day at 4 p.m. "But when a death call comes in at 3:30 a.m. on a Saturday morning, you can't tell the D.A. it's going to have to wait until Monday. It has to be investigated as quickly as possible." Kiessling said his autopsy budget has doubled in the last year. Because there is no forensic pathologist on staff, all bodies have to be taken 144 miles to Allentown, "a two-and-a-half hour trip every time we need one." "We can't afford to run all these cases," said Kiessling, who also serves as president of the Pennsylvania Coroner's Association. "I'd need at least another $100,000 in my budget." Overtaxed budgets, the extra work, and constant tragedy have hardened coroners' views on the opioid crisis. They don't hold back their frustration. "There's too many lives lost," said Westmoreland County coroner Ken Batcha. "We saw a mom, a dad and a daughter who all died within 18 months of ODs in the same house in the city of Jeannette," a town southeast of Pittsburgh. "A young man was found dead in the morning in Youngwood, and 7½ hours later his brother was found dead in the same room. It takes an emotional toll." Kiessling believes laws need to be changed to allow for the involuntary commitment of people who repeatedly OD. Naloxone, an opioid antidote known by the brand name Narcan, can resuscitate someone in the throes of an overdose. "But Narcan is only changing their date of death," Kiessling said. "We don't let someone who tries to commit suicide walk out of the ER. However, you can basically be dead, get Narcan, and sign out of the ER without getting long-term treatment. Unless we tighten down, we're going to continue to need body bags." In an autopsy suite at the Montgomery County coroner's office, Balacki rolled out a small pull wagon, green-painted with large rubber wheels, next to a small stainless steel lab table called a "grossing station." About 40 pickling jars sat in the wagon's bed. Balacki pulled one and set it on the steel table. Inside the glass container, a stew of internal organs — pieces of brain, lungs, liver, pancreas, and pituitary gland — was packed in a murky preservative. "With every autopsy, we retain samples," Balacki said. "If we think it's a drug death but the toxicology has come back negative, we can run further tests later." The office holds on to the organs harvested from homicides and undetermined deaths "forever," he said, in case they're needed as evidence in a future court case. In a steel cabinet in a former office labeled "Drying Room," the unclaimed ashes of more than 70 people await interment. Many are contained in wooden boxes with brass plates engraved with the names of the dead. Most of the remains are from natural deaths. With adult drug overdose victims, Balacki said, family "almost always" collect their loved ones. However, on a lower shelf, white cardboard packages the size of perfume boxes hold the ashes of infants. "Some of them were due to drugs," Balacki said. "The mom was on drugs and lost the baby." About every 10 years, a local funeral home is asked to perform a memorial and a mass burial of the unclaimed. The cabinet is reaching capacity. 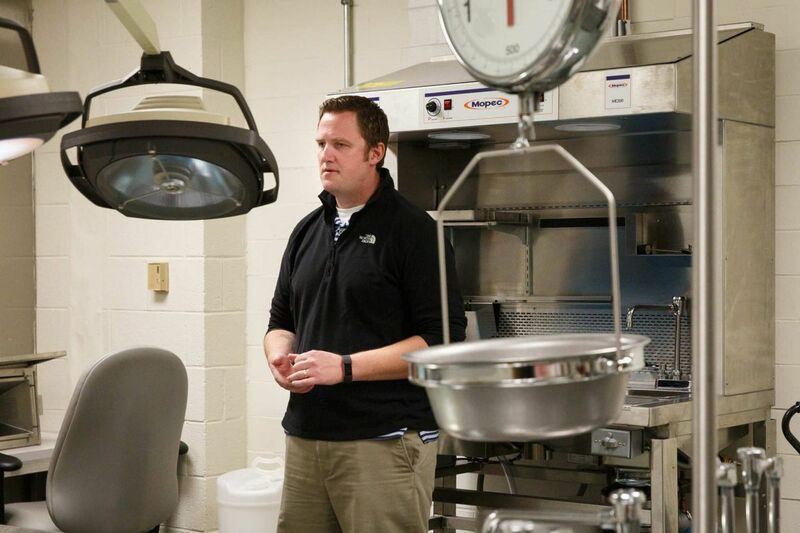 Alexander Balacki, first deputy coroner for Montgomery County, at a cabinet filled with unclaimed remains. The ashes of infants are contained in small boxes on a lower shelf. The image has been edited to remove identifying information on the evidence bag.